Have you long been a fan of vampire lore? Are you excited about Halloween? Now is the time to kick off the fall holiday fun and enjoy an updated version of a legendary thriller. South Texas College’s Theatre Department kicks off its second full season of productions with Steven Dietz’s “Dracula.” The show runs from Oct. 13 to 15, 2011 at 8 p.m., with a Sunday matinee on Oct. 16 at 2 p.m. The Count takes stage at STC’s Pecan Campus Cooper Center for Communication Arts located at 3201 W. Pecan Blvd. in McAllen. 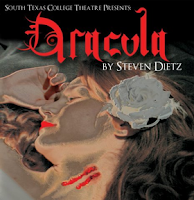 “Dietz restores the suspense and seduction of Bram Stoker’s classic novel in this thrilling adaptation, adding a modern edge that will resonate with our community,” said Joel Jason Rodriguez, STC drama instructor and play director. “Our Count Dracula is all vampire lovers will expect and more, and audiences will be captivated by his charisma as he exerts his will upon the residents of London as they valiantly attempt to save themselves from a hideous fate. Tickets are $5 for STC students, faculty and staff members, senior citizens, and members of the military and $10 for general admission. The Sunday matinee production will be interpreted in American Sign Language by student interns from STC’s Interpreter Training Program. For those who wish to attend the theatre year round and support the students’ artistic endeavors, patrons are invited to subscribe to the STC Theater Department’s Season Pass Program. With the pass, subscribers are given tickets for all productions and receive special deals for added guest performances that may occur throughout the year. Season pass prices are $15 for STC students, faculty and staff members, senior citizens, and members of the military and $25 for community members. For additional information about the show, upcoming performances, tickets or season passes visit http://lass.southtexascollege.edu/ca/drama/dept/news.html or call 956-872-2366 or 956-872-2348.